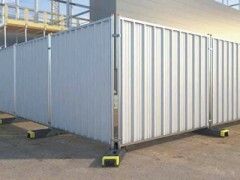 Panel height: 1800 mm to 2400 mm. Panel length: 2000 mm to 2400 mm. Sheet thickness: 0.4 mm to 0.7 mm. U-profile: 50-30-50 mm, 50-40-50 mm, 60-40-60 mm.